I wouldn’t expect X-Art Amanda to be able to do any of the stunts that Scarlett Johansson does as Black Widow in the Avengers movies, but I’m willing to bet this talented adult actress has a few stunts of her own up her sleeve, and she probably sweeps just as many men off their feet as Black Widow does too! Taylor Swift might sing the song, “I Knew You Were Trouble” but Jana Jordan probably says it more often in her videos. The only other thing Jana Jordan has in common with Taylor Swift other than their looks is that you “swiftly” delete Jordan from your search history afterwards before the wife gets home. This is just uncanny, isn’t it? The ironic thing is that if Alicia can look like the “Anaconda” singer and do all the raunchy stuff she does on camera, than she’s actually just a more talented version of Nicki Minaj – like Nicki Minaj 1.5! Then again, she might look like Nicki but does she have the gigantic trademark booty to match it? The New Girl actress is a rising star in Hollywood at the moment, while Ellie Idol is a rising star in her own version of Hollywood stardom. 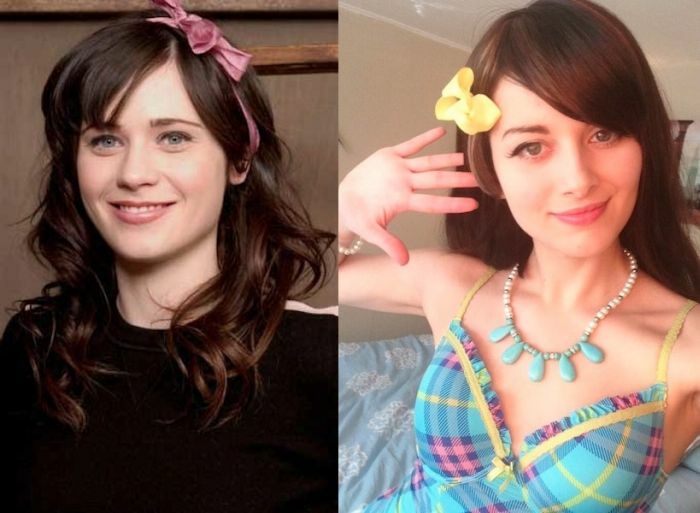 If you ever find yourself wondering what it would be like if Zooey Deschanel had journeyed down the less respectable industry of cinema, Ellie Idol is the answer. While Katy Perry has made a huge departure from the Christian pop singer she started out as way back in the day before she was famous, she’s nowhere near as naughty as her adult film doppelganger, Natasha Nice. Their chests might not look the same but their faces certainly do, wouldn’t you agree. Seeing how Anna Kendrick has a habit of playing the “nice girl” in most of her films, Abigaile Johnson must be her evil twin. After all, they pretty much look identical and they both star in front of the camera, but the roles they choose are very, very… VERY different. If Lindsay keeps heading down the same road as other female celebrities early to fame like Paris Hilton and Kim Kardashian, than we can probably expect an actual [email protected] tape from her any day now. Until then though, here is Dani Jensen, and I bet if we hadn’t labeled the two images you’d struggle to work out which is which. Did you ever see Kate Beckinsale in those black tights she wore in all the Underworld movies and wish you could see more? Well Crystal Klein can offer you the next best thing! Thanks, Crystal! Also, it gives us a glimpse of what a blonde Kate Beckinsale would look like: pretty hot, don’t you think?